In a large skillet, heat the oil over medium-high heat. Sauté the vegetables for 5 minutes until tender. Add the basil, oregano, 1 teaspoon salt, 1 teaspoon pepper, cumin and garlic powder. Stir. In a large bowl, combine the vegetable mixture, ground rice cakes, eggs, ground turkey, turkey sausage, remaining 1 teaspoon salt and remaining 1 teaspoon pepper. Form ¼ cup loaves with the turkey mixture. Place the loaves ¼-inch apart on the baking sheet. Bake for 10 minutes, remove. 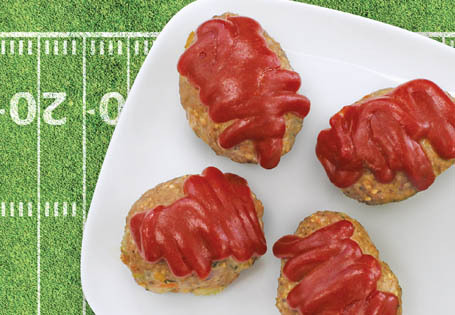 Squeeze the ketchup on top of each meat loaf. Return to the oven for 20 minutes or until the internal temperature reaches 165°.